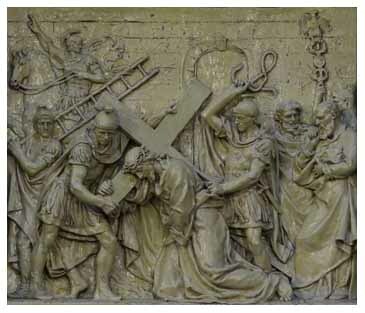 Fourteen stations of the cross, done in relief, approximately 32" w. x 30" h. One relief is installed over each of the twelve confessionals, with the final pair (Stations I and XII, respectively) flanking the sanctuary space. Due to challenging lighting conditions at shot-time, processing of photos is a work in progress. Please revisit from time to time.